Constitutional Carry Passes Senate Committee 3-2! Yesterday marked yet another historic day for gun owners in Wisconsin, and it was all made possible by great grassroots activists like you! We have a long way to go, and we need your immediate help — more on that in a minute. It was a day that gun owners in Wisconsin had been fighting for since the hearing for Constitutional Carry that took place on May 31st, 2017. From that day until now, you guys contacted the committee members and pushed them to hold a hearing on this bill. Your efforts were relentless, and they paid off! The committee heard your voices loud and clear and finally scheduled a public vote on this monumental piece of pro-gun legislation. But it didn’t come easy, or without opposition. Moms Demand Action and Wisconsin Anti-Violence Effort have been pushing hard to kill this bill. With the full backing of Michael Bloomberg and his deeply lined pockets, they put everything they had into stopping the committee from a holding a vote. But you can be sure that they aren’t going to give up now. Quite the contrary. They are going to be fighting as hard as ever to prevent a full vote in the Senate. We saw their resolve yesterday. 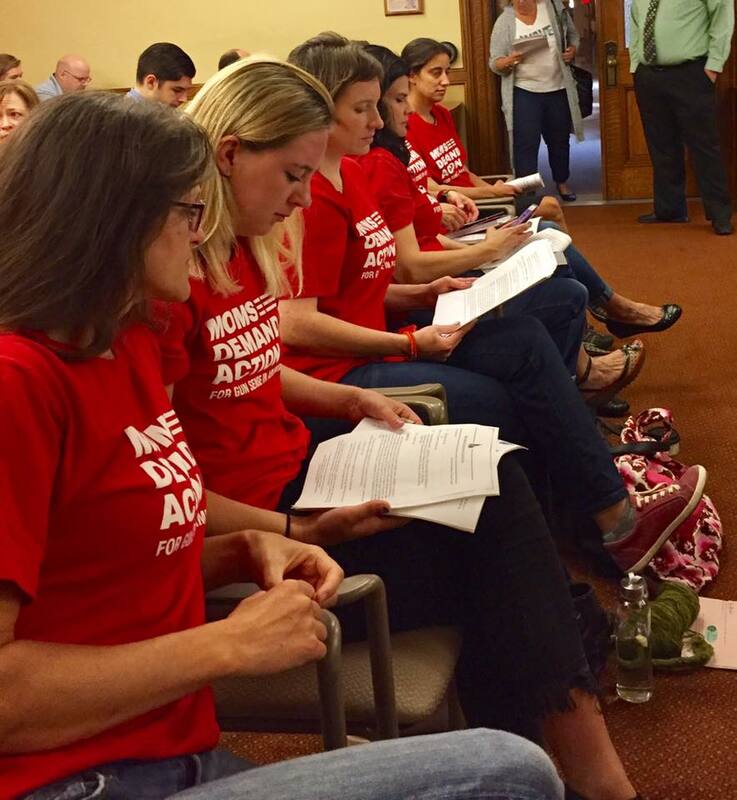 As we sat in the Capitol listening to the debate from the Senators on this bill, we noticed that one whole side of the room was filled with anti-gunners. We were outnumbered at least 5 to 1! And they used their large crowd to mock, whine, groan, and speak out during the legislative process. This committee hearing was not supposed to have any input from the public, and that rule was quickly ignored by the anti-gun crowd. Did they even see the irony of their own actions yesterday? If the anti-gun crowd can’t respect the procedures of the legislative process, do they really expect criminals to follow the concealed carry laws? You see, we know this is exactly why Constitutional Carry is so important! It puts law-abiding citizens back in control of their Constitutionally protected 2nd Amendment right, and it puts law-abiding citizens on equal ground with the criminals who already ignore the law! No longer would we need permission for a right. No longer would we be adding our name to a government database. No longer would we be required to jump through hoops to protect our families. We would be joining a growing list of states that are moving to restore the 2nd Amendment. Currently, 13 states enjoy the right of Constitutional Carry and many others, like Wisconsin, are pushing it forward. In fact, for Wisconsinites, yesterday was the first ever vote on Constitutional Carry! There was a lot that happened yesterday in the hearing, and you can watch our full summary on what took place by clicking here. At the end of the day, gun owners scored a major victory with a committee vote that will send the bill on to the full Senate for consideration. And that’s why we need your immediate help! >>> First, we need you to contact your Senator right away by email, phone, and social media and tell them to vote for Constitutional Carry, Senate Bill 169, with no weakening amendments! You can type your address into the link here if you don’t know who your Senator is. >>> Second, please consider a generous donation to the Wisconsin Firearms Coalition of $100, $50, or even just $25 today to help us mobilize more gun owners before the Senate votes on this bill. >>> Finally, after you have viewed the Facebook video detailing the events of yesterday, make sure to send the video and this email to ALL your family and friends so they can help in this effort as well. It is the people, the grassroots activists, that make all the difference. You guys made yesterday happen, and it will be your efforts once again that push a vote in the full Senate. But your Senators must know where you stand, so there is no time to rest with this victory we have achieved yesterday. Act now, and let’s roll our efforts into the next phase, a full vote in the Senate! P.S. In a monumental vote for Wisconsin’s gun owners, the Senate Committee on Judiciary and Public Safety voted in favor of Constitutional Carry on a 3-2 vote! The bill now heads to the full Senate. In the meantime, Bloomberg and his anti-gun front groups are going to be pushing even harder to prevent this bill from getting the big vote that we need. It’s up to gun owners to keep it moving forward! Please make sure to watch our video recap from yesterday and then please consider a $100, $50, or $25 donation to the Wisconsin Firearms Coalition today to help us mobilize gun owners across Wisconsin to push this bill to the full Senate!